If you’ve always longed to make a gingerbread house but couldn’t find time during the winter holidays, this is your chance to shine! 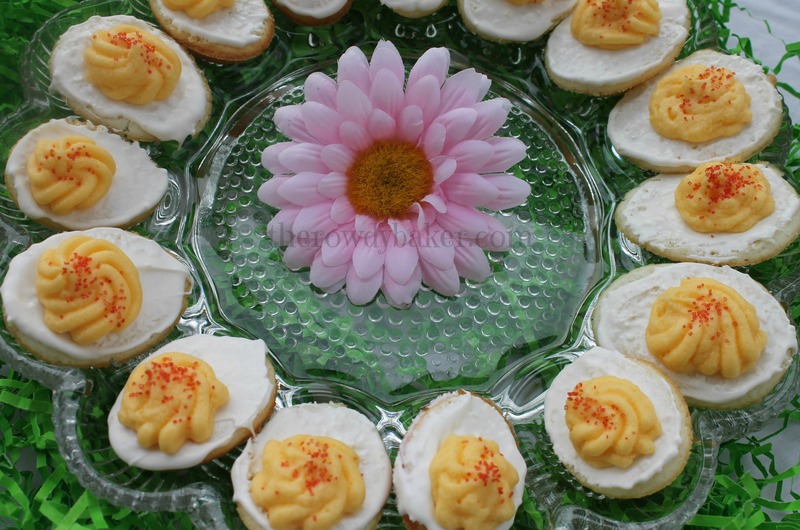 Orange flavored sugar cookie dough is rolled and cut into six pieces, glued together with royal icing, and decorated to your heart’s content. Use your creation as a centerpiece instead of lilies; it’ll produce smiles rather than sneezes. I’ve actually made two of these bad boys this year, trying out different sizes, shapes, and ideas. Here’s the one I made for a feature titled Super Sides in the Spokesman Review, a Spokane daily newspaper. It was a little more elaborate, with cookie fencing and a white chocolate conveyor belt carrying white eggs into the house and colored eggs back out for the bunnies to load into baskets. I had a blast making it (and “testing” the candy for freshness). I changed the dough a little bit for this house. Originally I used shortening for a more stable dough. For this version I substituted a little butter for part of the shortening and removed part of the leavening, and it worked just as well. The odds are no one will actually eat the house, but just in case, I also added some orange juice concentrate for more flavor. And, yeah . . . it’s a little wonky. And I forgot to put the doors in before I set the roof, so one of them may be leaning a bit. But it has character, right? Charm. Kind of like a little Hobbit house. I added some chickens to my yard. I cut them from leftover dough and painted them with melted candy melts. Close up of the side yard, with chicken and nests. If you make one of these, I’d sure love to see a photo of it! Just post it on my Rowdy Baker Facebook Page or email it to therowdybaker@hotmail.com. Can’t wait to see what you come up with. There was no way I could stuff all the instructions and ideas into one recipe, so I’ll add some tips below. And . . . here are my templates. You can see that the front and back pieces are angled to be wider on the bottom. I gave the measurement from the corner where the side meets the angle for the peak. That’s where your sides will go (on the back of the piece, of course) so you can angle it out as much as you want from that point. Yeah, yeah, I know the window isn’t centered. We’ve discussed my issues with spacial concepts before, and I assure you there has been no improvement. While I’m confessing my problem, I’ll confide that this house was supposed to be bigger at the top and smaller at the bottom, Like a Dr. Seuss house, but I somehow measured the roof for the wrong end. Sigh. I like it this way, so it wasn’t a total loss. Besides, it’s probably a lot more sturdy this way. Makes enough dough for a house and fence if you are so inclined. Or you can simply roll it out, cut it into desired shapes, dust the cookies with colored sugar, and bake! Cut house templates out of card stock or heavy paper. Cut out windows and doors. In a large bowl (stand mixer is best), beat shortening, butter, and sugar for 1 minute. Add egg, milk, frozen orange juice concentrate, and vanilla, and beat well. Add flour, baking powder, and salt and mix until combined. Dough will be stiff. Working with ⅓ of the dough at a time, roll out on lightly floured parchment paper, about ¼-inch thick. Bake approximately 15 minutes, or until the edges are beginning to turn golden brown. Remove from oven. Hold your template over the pieces. If they have spread, take a sharp knife and trim them to size. Allow to cool on rack. Repeat with the remaining pieces. If any pieces feel soft after cooling, put them back in the oven for a few minutes. They must be very firm. If you are making fences, cut the long parallel support pieces and short vertical fence pieces. Don’t put them together before baking or the fence posts will droop between the support pieces. Bake them separately and put them together with royal icing after they cool. 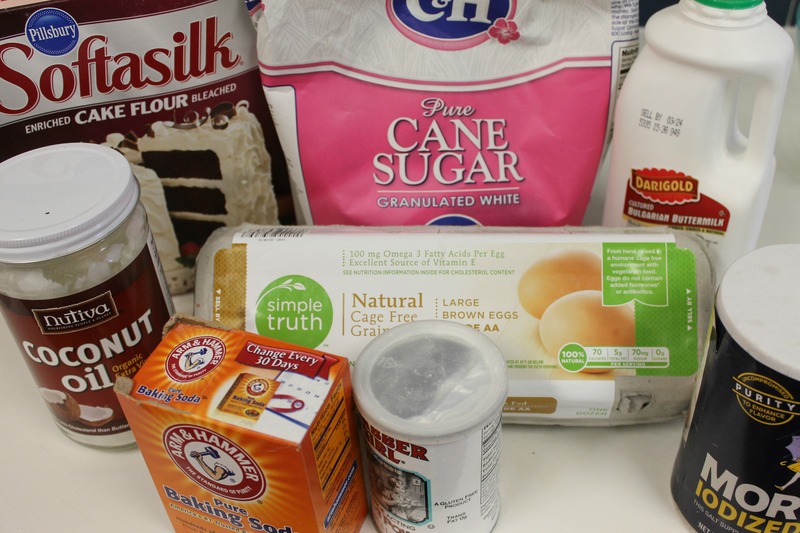 MAKE ROYAL ICING: In a large bowl, combine the powdered sugar and meringue powder. Gradually add water until it is very thick and creamy. Add additional water if necessary, ¼ teaspoon at a time. Beat for at least 5 minutes. 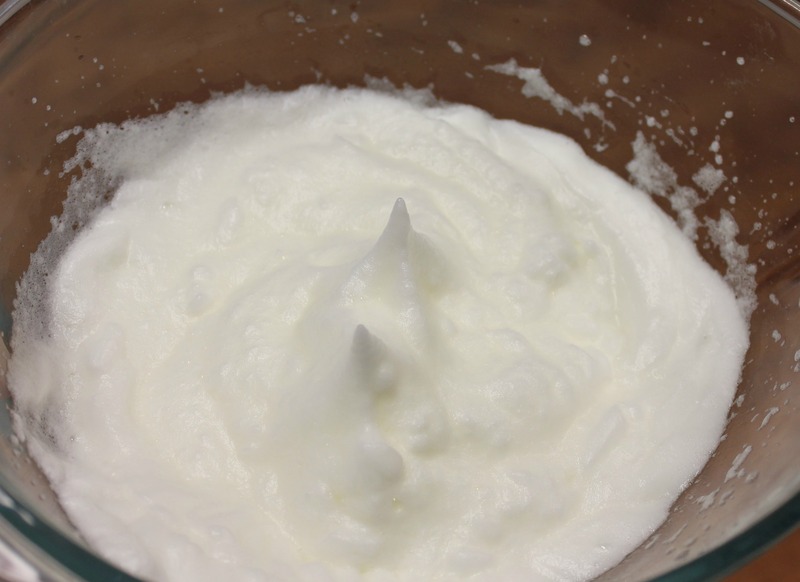 Mixture should make stiff peaks. 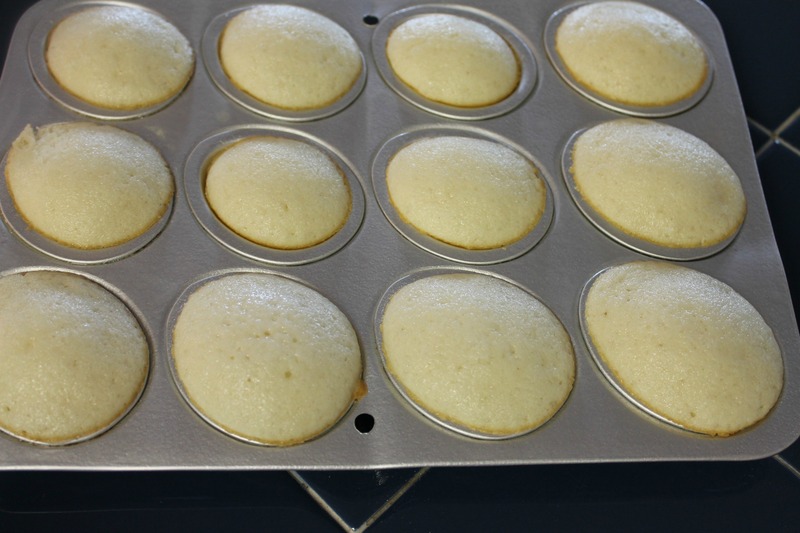 Transfer 1 cup of icing to a small pastry bag or storage bag with the tip snipped off. This will be used to glue your house together. Small amounts can be colored for flowers and other decorations. Color the remaining icing green. Keep royal icing covered when not using or it will dry out quickly. You may want to decorate your outside walls and roof before construction. It’s easier to do this on a flat surface! Use a small amount of royal icing to attach candy and decorations and allow them to dry. Flat candy wafers or sour strips make great roof tiles. Add shutters to the upper windows. For easy window boxes, pipe melted chocolate along the bottom of the side windows. Set carrots made from candy melts (or little candy flowers) along the edge and then cover with a little more chocolate, letting the tops peep out. Let dry thoroughly. The walls will go up first. Pipe a generous amount of icing along the short edges of one side piece. Using heavy cans to brace the structure as you go, connect a side piece to the front piece. Because the front and back pieces curve instead of creating a 90-degree angle, the side pieces will fit slightly inside inside, so the front and back will stick out a little on each side. Add the back piece and the other side. Make sure your house is straight, and then let it dry overnight. Spread green icing on a sturdy cake board. Carefully pick up your house and place it on the icing. If you have extra icing, save it for grass and bushes. Place your doors now, if you're having them open into the house. Add a little icing to the "hinge" side for extra stability. Add bunnies looking out the windows if you wish. Pipe a generous amount of white icing along the top edges of the house – on the sides and the roof pitch. Place one roof piece on the house and carefully stick two pins through the roof into the house, almost at the tip of the pitch, one at the front of the house, one at the back. Repeat with the other roof piece. You can add a couple of pins along the roof line if necessary, pinning one side to the other. Count how many pins you use so you're sure to remove them all at the end! If you are adding a fence, do so now while the green icing is still soft. While the roof is drying, you can decorate the yard. Add vines, grass, bushes, and flowers using colored royal icing. Crush chocolate cookies for a garden bed. Build a fence using cookie dough or a row of marshmallow bunnies. Set a chocolate bunny by the front door. Add nests using crushed shredded wheat, baked cookie dough, icing, or edible Easter grass and fill them with candy eggs or jelly beans. Make a walkway out of candy rocks or flat candy (like Smarties or Pez). Once the roof feels solid, (several hours) PULL OUT THE PINS. Count them to make sure you have them all, and then enjoy your masterpiece. Use templates to cut out shapes. Don’t remove windows and doors until the house is baked. Slide parchment onto baking sheet and bake 15 minutes. Cans hold the house together while it dries. See the pin? That will help hold the roof on until the icing has a chance to harden. Yes, I could have brought the “tiles” to the roof peak. If I had more. If someone hadn’t eaten them. OK, fine. I’ll admit it. It was I who ate them. I did. I LOVE sour candy. Meh. Jelly beans are cute anyhow. There will be plenty of dough for the house, with enough left over to play with. Make a small picket fence, and glue it together when you put your house together so it has a chance to dry. Place it on the soft green icing when your house is placed. Or make little chickens (see the photo above), baskets, nests. Maybe a mailbox with “E. Bunny” on it. Make sure the cookie pieces are thoroughly baked. If they feel soft after they’ve cooled, put them back in the oven for a few minutes. I made curtains from white chocolate for one of the windows. It was tricky, but cute. I spread a little melted chocolate on a piece of plastic wrap and then laid it over a few skewers to get a rippled effect. Once it hardened, a piece was attached to each side (inside of the window) with royal icing. Space out your roofing as much as possible without seeing gaping holes. That stuff gets heavy fast. Candy melts (melted, of course) painted on the doors and shutters with a pastry brush will look like wood grain. I couldn’t find edible Easter grass this year, but if you can get your hands on some, it would look great chopped up and sprinkled over the green icing. I gave this house to the gal that cuts my hair. Someone there asked me what I charged for them, and I told her that I didn’t sell them. There is way too much time and fussing and swearing to make it anything but a labor of love. The thing is, though, once you make one the next one is much easier. And . . . I guess if you make a few for family and friends, there won’t be quite so much leftover Easter candy to *ahem* dispose of. Your call. 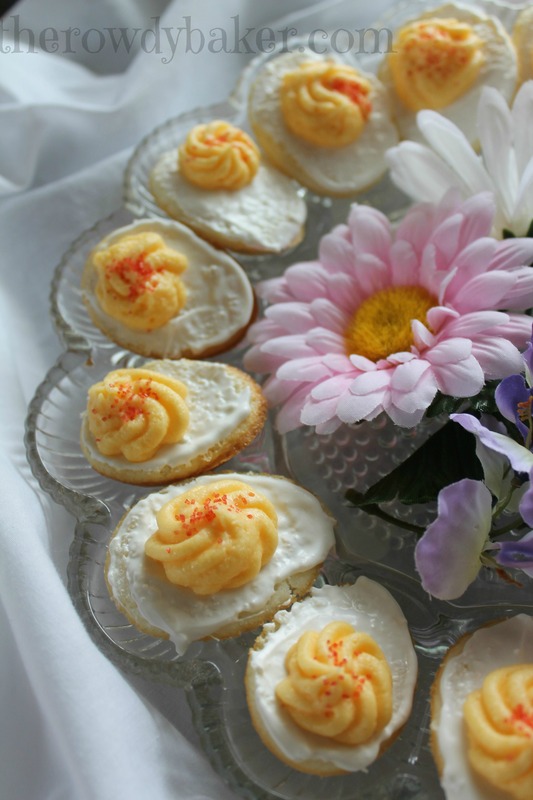 Sweet little jelly bean bees usher in Spring with this honey and lemon cheesecake. Honey adds a mellow sweetness, and sour cream gives it a light tang – a perfect combination! The cheesecake is easy; making the bees takes a bit of patience and fine motor skills. If you’re not up for that, they sell cute little pre-made bees and flowers too, and no one will judge you! I made small bees using a yellow jelly bean, two slices for wings, and a small piece cut off one end of a jelly bean for the head. A black food color pen works really well for the stripes and eyes. I tried making a stinger out of dark chocolate, but frankly…it looked like the bee was pooping. Had a good laugh over that one. Tiny slices of black jelly beans kind of worked, but I wasn’t very happy with them. Next time I’ll buy some black licorice. Just for grins, I also made some larger bees, using yellow peanut M&Ms. They looked more like big fat bumblebees…very cute. Those are around the base of the cake. I found that toothpicks really helped hold the bees in place while I fussed with them and while they dried. (This obviously doesn’t work for the M&M bees – they just have to chill on the plate.) A piece of styrofoam is nice to stick the toothpicks into, but use your imagination. A small box or even a potato would work well, too! I made the little violet flowers and the bee hive out of royal icing. (Make sure the icing is very stiff when you pipe the bee hive. or maybe you could make one out of half of a lemon?) I forgot to add leaves. Grrrr. The green icing was sitting on the counter in a pastry bag with a leaf tip, and I forgot to use it! I think it would have looked a lot prettier with that touch of green. The honey comb was made from melted white chocolate, with a little milk chocolate and a tiny bit of yellow candy coloring (a yellow candy melt would work too) to achieve a honey color. Spread it over bubble wrap and place in the freezer until hard, then just peel off and break into pieces. And….here’s the recipe for the cheesecake! Honey gives this cheesecake a lovely, mellow sweetness. Trap the parchment with the ring. There should be a cute little ruffle sticking out. I like the clean look I get when I do this with parchment. 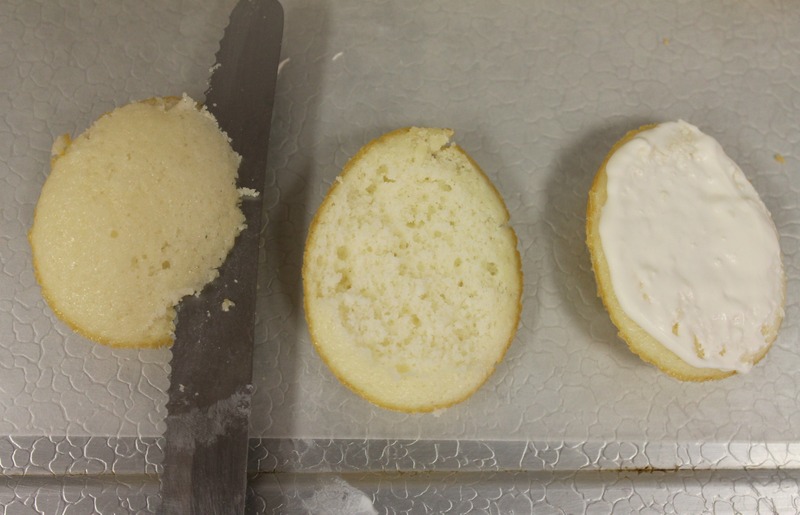 But…it will ooze butter, so make sure the cheesecake is setting on a baking pan – preferably lined with foil! Really press to make sure the crust stays in place since it isn’t pre-baked. Pour batter into crust and smooth with a knife. Once your cheesecake is chilled, pipe whipped cream around the edge and decorate to suit your tastes. You might even want to drizzle a little honey on the top. And here’s another version, using colored whipped topping for the pastel flowers. As much as I love winter, I’m so happy Spring is officially here! More Easter recipes to come. 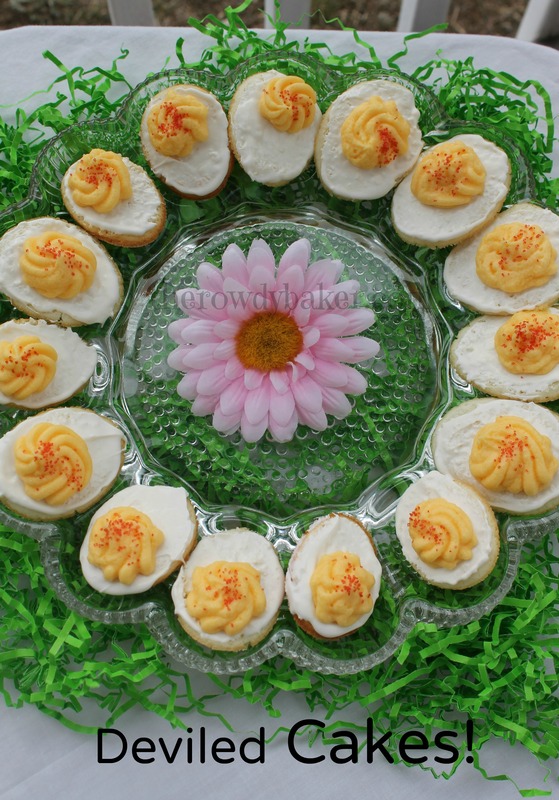 For a fun spin on traditional Easter food, make these sweet little cakes that look like deviled eggs! The cake is tender and white, and is covered with a light coating of white chocolate, then decorated with yellow whipped buttercream icing. A dash of red sprinkles gives the appearance of paprika. At first glance, they will really fool you! We may have an eensy-weensy problem here, though. 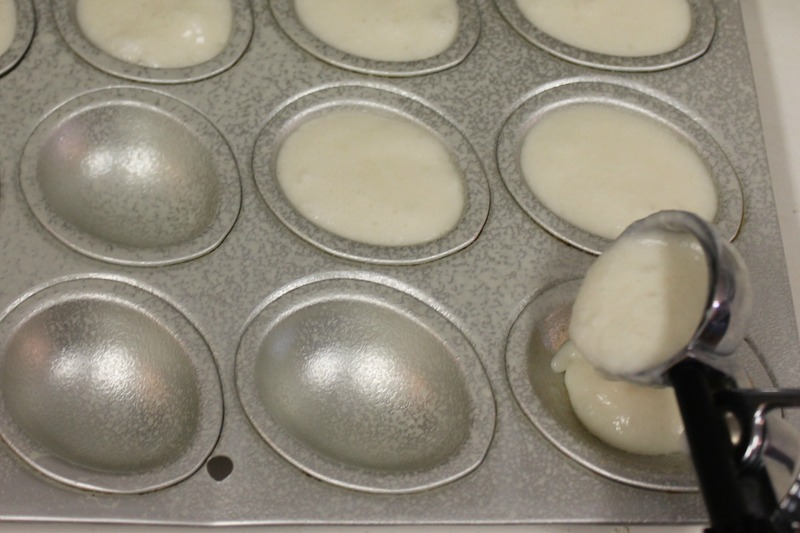 The pan I used (Wilton’s Petite Egg Pan) is no longer available. If you are lucky enough to have one, or there is someone you can steal borrow one from, you’re set. OR if you are wealthy and money is no object, there is a similar pan on the market that runs around $100. Such a deal! Worst case scenario, Wilton has a small egg pan that has designs on it. Since you really only see the top of the egg anyhow, I think it would work just fine. Hopefully you’ll figure something out, because these are just so much fun to make! I’d love to say I thought up this idea, but The Man was the one who came up with it. I guess now he’s the idea man, and I’m the lowly person who does the grunt work. Meh…that’s okay. He deserves his moment in the limelight for this. I tried to make the whitest cake possible, so used coconut oil instead of butter (it adds a lovely coconut flavor, but you can use shortening if you’d like) and didn’t use vanilla. If you have clear vanilla, go ahead and put a teaspoon in when you cream the oil and sugar together. Also, because I used whipping cream in the frosting to make it look fluffier, these really should be refrigerated. Makes a LOT. At least 7 dozen, maybe more. You could also make 2 dozen and bake the rest of the batter in a 9" cake pan for another use. 1 pound white candy melts (get the whitest ones possible. I used Wilton's "Bright White"
Prepare pan by greasing and flouring, or by spraying with a flour/oil combination spray like Baker's Joy. In a medium bowl, whip the egg whites until stiff peaks form. 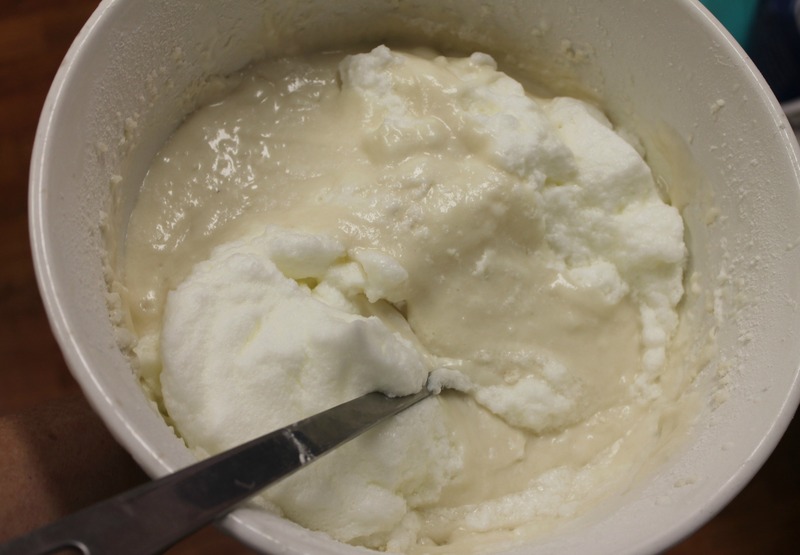 In a large bowl, cream the oil (or shortening), sugar, and clear vanilla. I used less oil than normal, so it won't get fluffy. Just mix it together really well. Alternately add the dry ingredients and buttermilk, beginning with the flour and ending with the buttermilk, about a third of each at a time. Beat for one minute on medium-high speed. Fill each egg cavity almost to the top. Bake for 8-9 minutes, or until the edges are beginning to turn golden brown and turn out onto racks to cool. Slice the domed tops off of each egg. Melt the white chocolate melts in the microwave at 15 second intervals, stirring each time until completely melted. With a table knife, spread a layer of white chocolate on the flat side (top) of each egg. In a large bowl, combine the butter and powdered sugar. Mix well. Add the whipping cream a little at a time until it reaches the desired consistency for piping, adding a little more cream or powdered sugar if necessary. Add a little yellow coloring and a TINY bit of orange or red. Whip the frosting to combine. Adjust the color to resemble deviled egg filling. Continue to beat the frosting until it is light and fluffy. 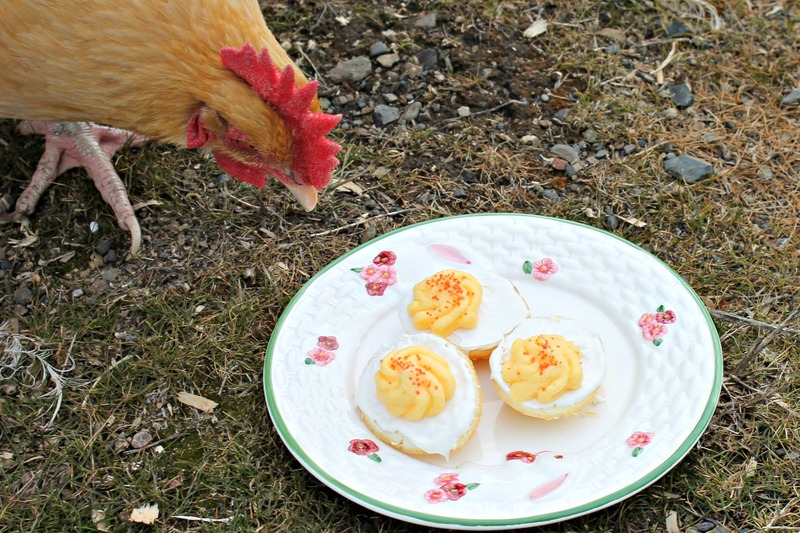 With a star tip, pipe the "yolk filling" on each egg. Dust with red sugar sprinkles. 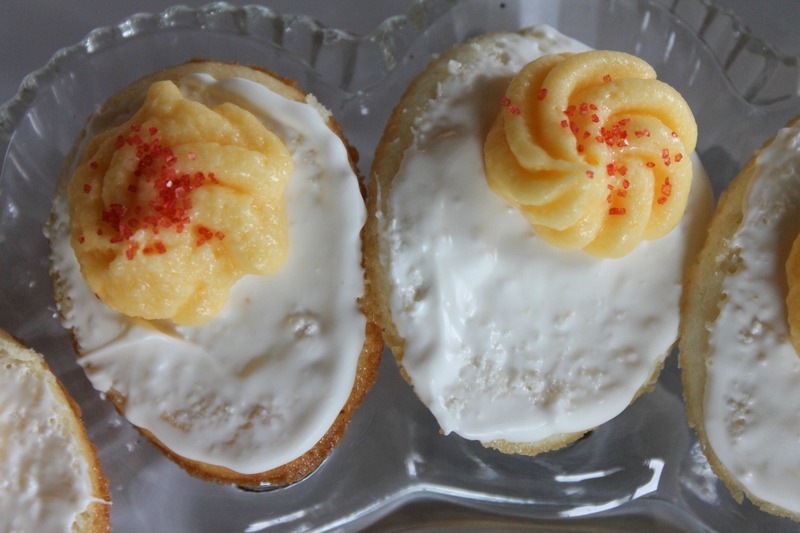 Level the tops (eat the scraps) and “frost” with white candy melts. Pipe the frosting and add sprinkles. TA DA!